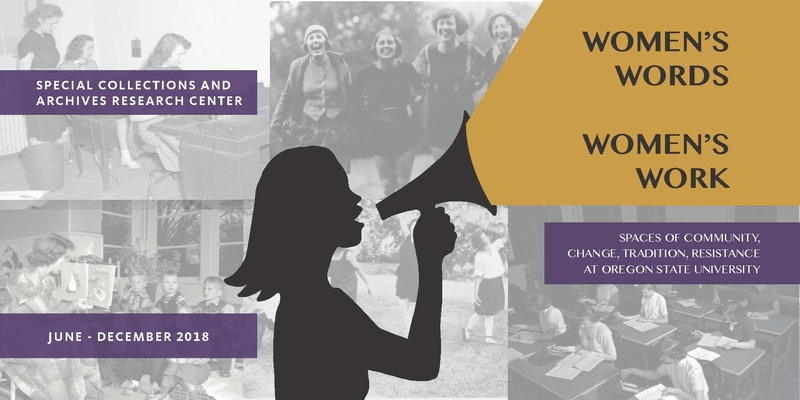 This guide was designed as a companion to the exhibit, Women's Voices, Women's Work: Spaces of community, change, tradition, and resistance at Oregon State University, which ran from June to December 2018. Each tab in this guide represents one of the five different panels of the exhibit - Academic, Administrative, Athletic, Community, and Environment - and the boxes on those tabs showcase the items and collections used in, or consulted for, the exhibit. Collections listed in this guide are identified by title and collection number. ​This guide highlights physical collections located in the Special Collections and Archives Research Center. However, links to digital versions of all images used in the exhibit, or consulted as part of its construction, are included on each tab. An online version of the exhibit has also been created, and can be viewed here. natural resources in the Pacific Northwest, especially agriculture and forestry. The Special Collections and Archives Research Center public service point is located in the Douglas Strain Reading Room on the 5th Floor of the Valley Library at Oregon State University. Our public service hours are Monday through Friday from 9:00am to 5:00pm during the academic year. We frequently close to accommodate class visits; if you plan to visit us, please check our calendar. See our Guide to the Special Collections and Archives Research Center for more on how to visit SCARC, find our collections, and research tips.